Do you like grilled cheese and supporting your fellow blue streaks? 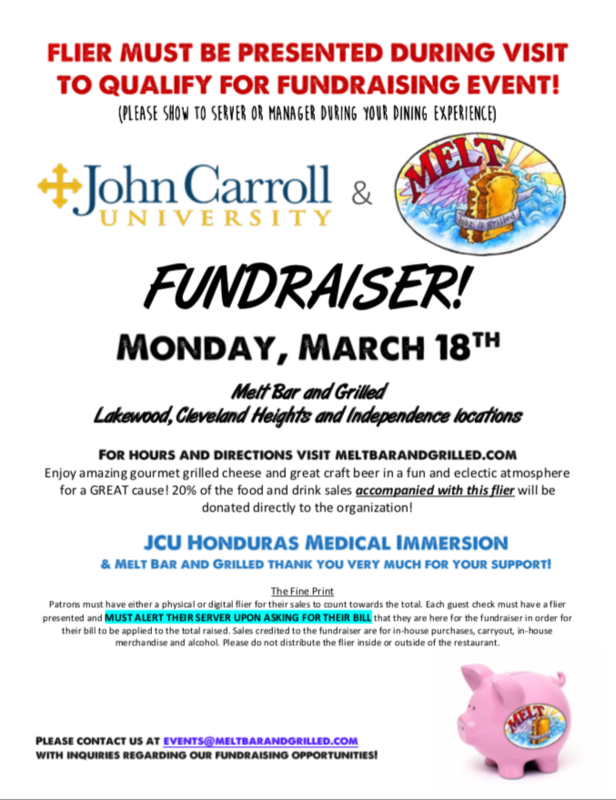 Well, join us with your friends and/or family on March 18th at any of the following Melt Bar and Grill Locations: Cleveland Heights (4PM-10PM), Lakewood (11AM-10PM), and Independence (11AM-10PM) for fantastic gourmet grilled cheese and great craft beer for a GREAT cause! 20% of the food and drink sales will be donated DIRECTLY to the Honduras Immersion. The Honduras Immersion offers medical services through medical brigades where simple diagnoses are made, and medicines are distributed. In addition, we will also work on public health mapping projects by identifying the locations of various transportation patterns, water supplies, clinics, and diseases. If you have any questions, please contact Dorothy Swagler at dswagler20@jcu.edu!